The drought that's drying up the Heartland isn't just an American problem. It's causing food prices to surge worldwide. And it could get worse. "This is not some gentle monthly wake-up call, it's the same global alarm that's been screaming at us since 2008," said Colin Roche of Oxfam, noting that the drought could lead to food shortages for millions of people worldwide. 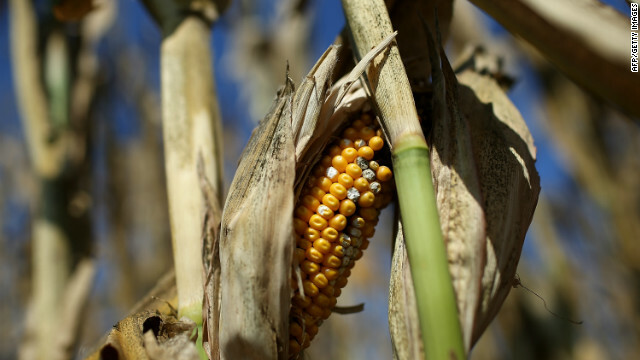 Food is a major U.S. export, so the drought affects prices around the globe. "World leaders must snap out of their lazy complacency and realize the time of cheap food has long gone," Roche said. In July, food prices jumped 6%, after three months of declines, according to the United Nations' monthly Food Price Index released Thursday. The main drivers behind the increase? Grain prices. And more specifically, corn prices, which have hit record highs in recent weeks. According to the U.N. report, global corn prices surged nearly 23% in July, exacerbated by "the severe deterioration of maize crop prospects in the United States, following drought conditions and excessive heat during critical stages of the crop development." "It's going to have a big impact [on consumers]," said Sam Zippin, an analyst at financial information firm Sageworks. "Corn is in almost everything." Food prices have been creeping up throughout the United States, as hot temperatures across the Midwestern and Western parts of the nation have dried out crops and driven up the price of corn and grain. This is all according to Obama's plan, does everyone not remember him announcing to the world that he wants to make energy prices necessarilly skyrocket? He juat got lucky and can blame the results on the weather or global warming so he can spemd even more of your money on his bogus green energy prokects that produce absolutely nothing for ypur money he wastes. You might as well do drugs, at least you will feel good for five minutes before you figure out you wasted your money. lmao @ little mister, cute! And @ anti american phil, you forgot a couple, *ankle biter and hag* lmfao!